Tree protectors are simply designed to protect and shelter trees/vines or new seedlings from their surrounding environment (rodents, sun, herbicides, birds, etc.). Tree protectors are manufactured in two different types of material, wet strength and poly coated; wet strength material usually lasts 12 months and poly coated material generally lasts 24 months. We manufacture tree protectors in a drop-on (pre-formed) style, which can also be manufactured as a lay flat style. 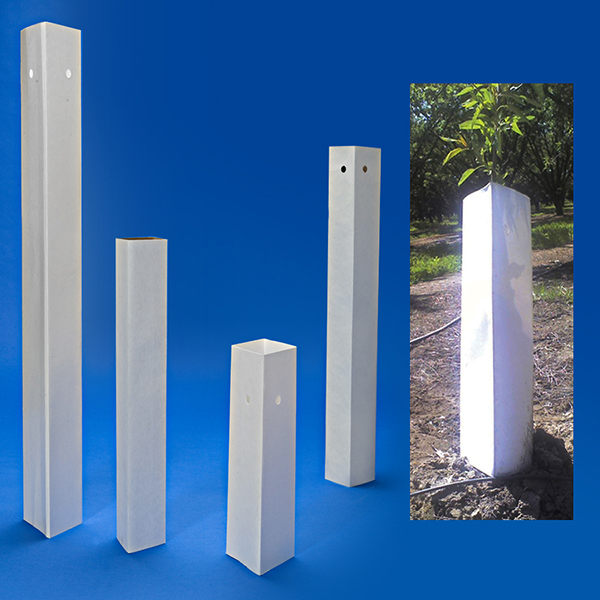 Drop-on tree protectors are available in 2.75in X specified length and 3.75in X specified length; some of the more popular lengths that we manufacture today include: 12, 18, 24, and 30 inches. We can produce tree protectors anywhere between the lengths of 12 and 30 inches; we are also able to produce our tree protects up to 6 inch squares used for grafting applications.